This cake is drool worthy. Salted. Caramel. Chocolate. Cheesecake. Cake. Seriously. This cake was sooo good. 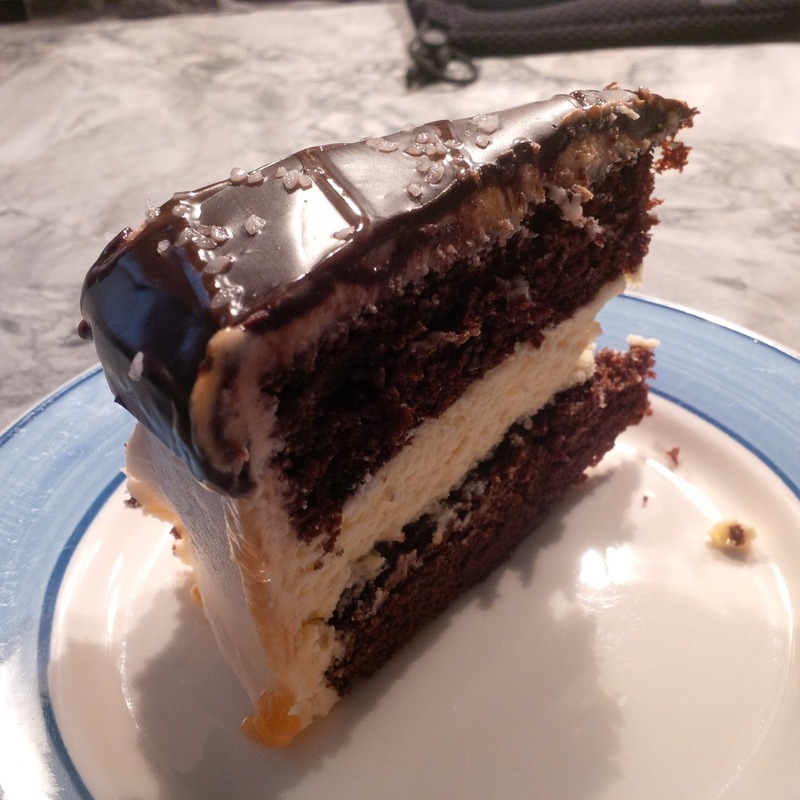 Basically is a smooth cheesecake sandwiched between two layers of rich chocolate cake, all covered with creamy salted caramel buttercream, topped with chocolate ganache, drizzled with more salted caramel, and sprinkled with sea salt. I started off by baking moist chocolate cake in 2 round cake pans. I used my trusted double chocolate cake recipe with lots of cocoa powder and coffee to really bring out that chocolate flavour. I then baked a plain cheesecake, no crust, in my spring-form pan. After baking, I put the cheese cake into the freezer for 2 hours before assembling. 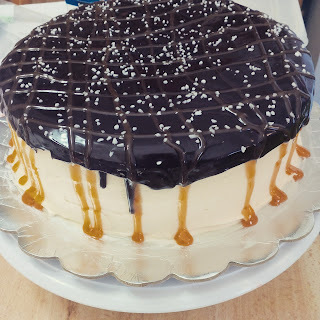 While the cheesecake was freezing, I whipped up a batch of salted caramel buttercream and made some dark chocolate ganache. I assembled the cake starting with a chocolate layer, than the cheese cake, then more chocolate cake. I crumb coated the entire cake with the buttercream and placed it back in the freezer for about 20 minutes. I then put a final layer of buttercream on the cake and topped it with a generous portion of the dark chocolate ganache. 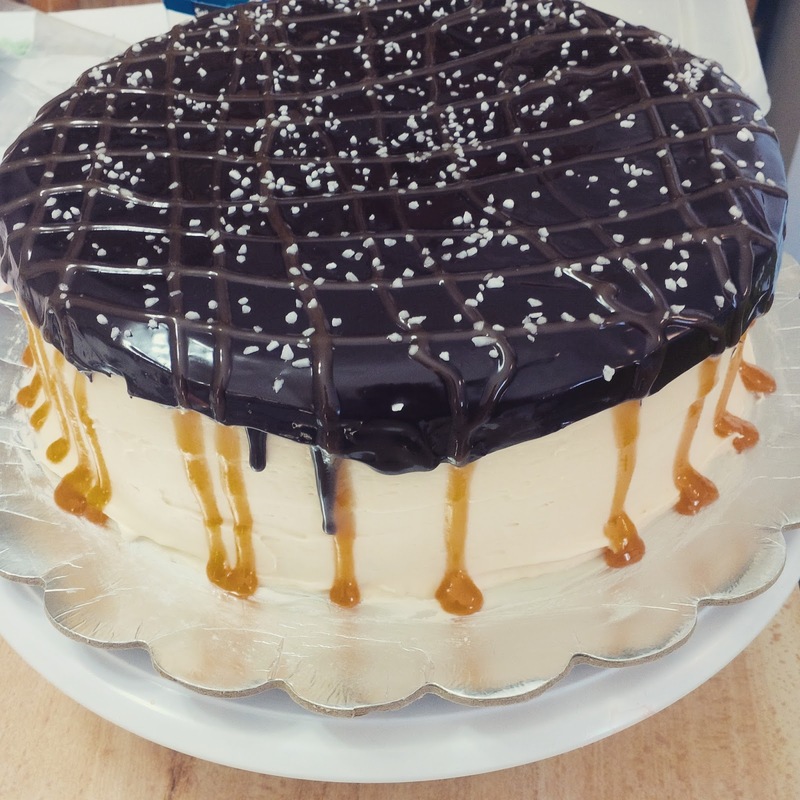 I poured the caramel into a piping bag and drizzled it over the top of the cake and then sprinkled it with large flake sea salt. Everyone raved about the cake and I will definitely be making this again. This would be the perfect cake for a special birthday or celebration, especially for those cheesecake lovers!